Hello hello and Happy New Year! How has your 2017 been so far? Mine has been shaping up to be really fun in a weird way. 2016 wasn’t quite done with me at the tail end haha! I ended up getting really, really sick and spent New Year’s Eve laid out on the couch, drifting in and out of sleep until midnight when I shared a midnight kiss with my bf and then went right to sleep. So exciting, right? I had to rest up, though, because I landed the contract of my dreams (!!!) but I can’t say anything until the *official* launch of the project. It might go longer than 1-3 months, it might not but for now, I’m enjoying the hell out of it and it has only been a week! I’m so grateful and I can’t wait to share what it is! Until then, what does January 2017 have cooking for us? January is full of some nice long-term planning! I love it! I have been bonding, like, A LOT with my Starchild lately. It feels like the volume on the imagery has been turned way up. This image speaks about long-term planning. 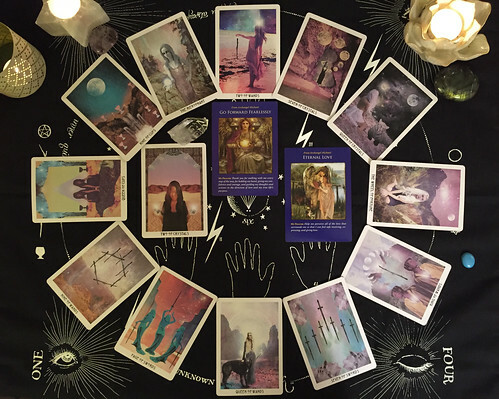 The two Wands represent paths we can take and it appears the woman in the card has picked hers…or has she? Each Wand as a path is interesting because she’s dropping one and is hiding one behind her back. That could be a couple of things: she could very well be symbolically dropping a Wand to say, “Nah, no thanks I’m good with the one behind my back already” or she could be dropping it into the sand as a marker, using the light to cast a shadow to point her in the right direction. The Wand behind her back could be the Shadow aspect of her choice – the things she’s not quite ready to face or it could represent the path that her Soul wants and she’s guarding it. Either way, she has to make a choice, much like we do at the start of every year, right? 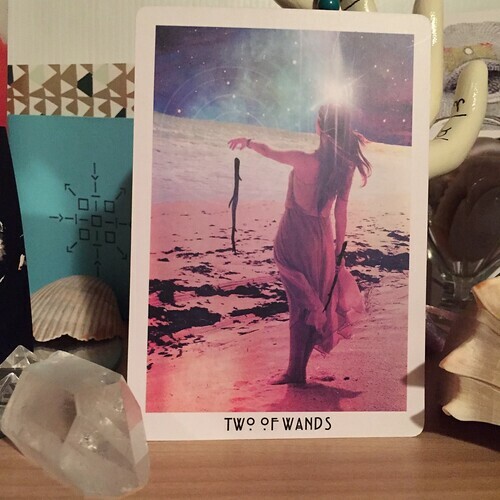 January is a great Two of Wands month because we don’t quite have the year planned out yet and we can easily start mapping it out. What are you seeing on the horizon? What possibilities are you envisioning? Do you have any goals or resolutions for the year? How will you start working towards them? For my Wheel of the Year, I like to draw a card to represent the overall theme, along with a beautiful message from Archangel Michael. The cards I pulled are quite powerful and I’m so happy about them! The Two of Crystals / Pentacles typically means balance but the look on her face says, “Oh, there’s way more than just balancing here!” I see a strong multitasker who can stay balanced on even the roughest terrain. This is also a reminder to stay on top of things, too. You can be a great multitasker but also lose track of things and this is a friendly reminder that you have to keep your wits about you at all times so that you can stay steady in all things. Archangel Michael had 2 messages for us! The first is so appropriate for the New Year: Go Forward Fearlessly. I mean, how perfect is that?! I saw that card when I was getting ready to shuffle the deck and thought to myself, “What a perfect message for 2017, right?” Right, indeed! This card is about moving towards your life’s purpose, your life goals. 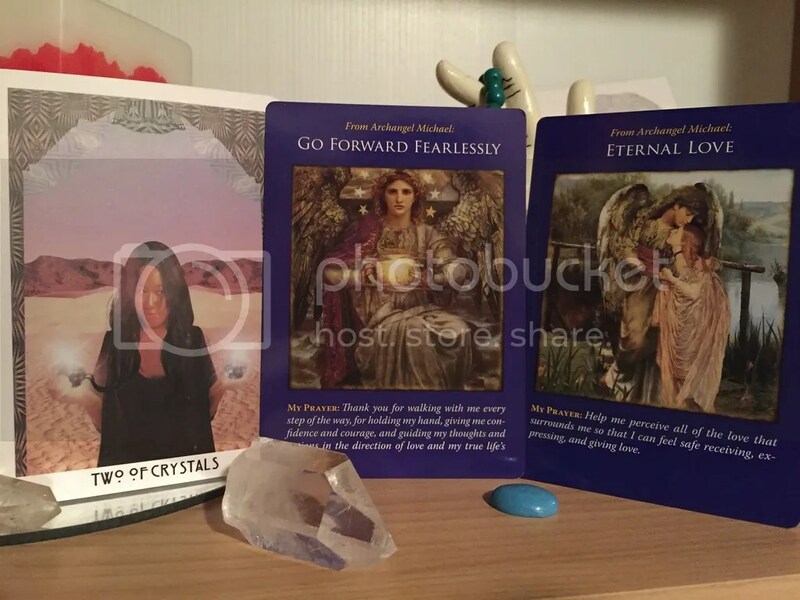 How great is it that Archangel Michael is here to help us move fearlessly towards our goals?! The second card that came out was Eternal Love. We need all the love we can get after a rough 2016, amirite? There is nothing quite like the Eternal Love from the Angels smiling down upon us. I love how this card symbolizes the love we are surrounded with while going towards our life’s purpose. What a positive way to kick off 2017! What goals are you working towards? How can you get there? Be sure to ask for angelic assistance! They’re here to help!